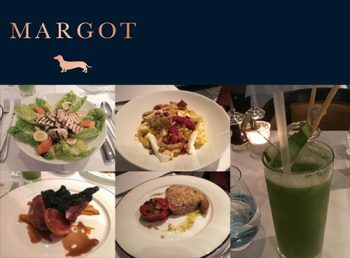 Seasoned professionals Paulo de Tarso and Nicolas Jaouën run the Italian restaurant Margot in Covent Garden, a celebration of seamless service, refined interiors and the authentic food of Italy, alongside an extensive international wine list. The restaurant offers guests a cosy escape from the bustle of Covent Garden’s Great Queen Street. The setting throughout provides a versatile backdrop and the perfect location for a relaxed lunch or atmospheric dinner, or to enjoy charcuterie and wine in the early evening, an aperitivo before a meal or late night digestivo. The carefully curated selection of dishes span expertly sourced cured meats, carpaccio and tartare dishes, salads, homemade pasta and a range of meat and fish main courses. Reflecting the restaurant’s service-led ethos, many dishes will be available in two portion sizes to allow for a flexible dining experience. To start we tried Lattughino Romano Baby lettuce, grilled chicken breast, quail eggs, roast pumpkin (£11.00) and Couscous Saffron couscous, roast purple aubergine, pomegranate, buffalo mozzarella, sun-blushed tomato (£11.00). And for mains the Filetto di tonno Almond-crusted seared fillet of tuna, Sicilian Caponata (£22.00) and the special of the day, Roast Duck. It’s a little pricey but ideally located around the corner from the New London Theatre and offers a relaxed and friendly atmosphere to chill out and relax with some posh nosh before or after a show. The restaurant also offers a great selection of cocktails and mocktails. Being Dry January we sampled the Mr. Greene – Non Alcoholic cocktail made with Cucumber juice, apple, agave syrup, lime.